Who doesn’t love a great one-pan meal? Be it one-pot, one-skillet, one sheet pan – they’re just my favorite because you basically just toss everything together and let it cook away for a bit. As an added bonus, sheet pan dinners mean virtually no clean up if you line your sheet pan with parchment paper or tin foil before baking! 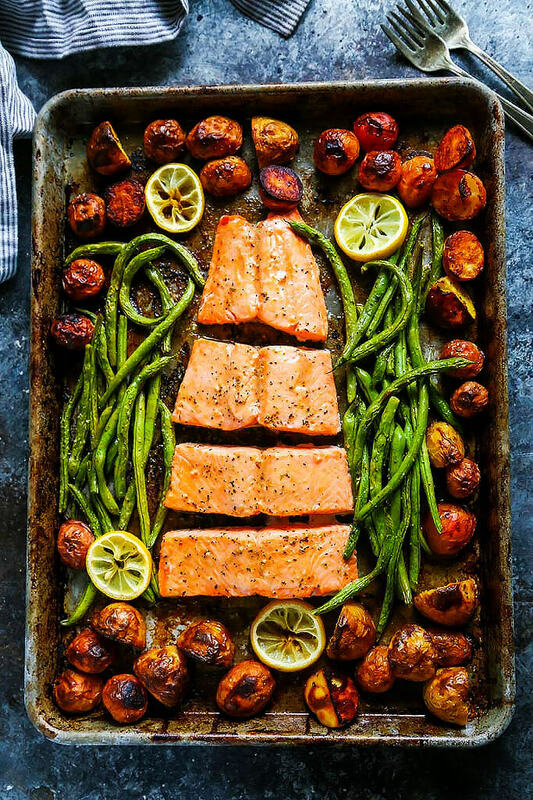 This particular 5-Ingredient Sheet Pan Salmon dinner was influenced by a chicken dish that my mom used to make a bit in our house. She’d take a bottle of Italian dressing and marinate some boneless, skinless chicken breasts in it overnight. They’d take on all that yummy tart and tangy flavor of the vinaigrette and absorb all those herbs too. Super easy and inexpensive! 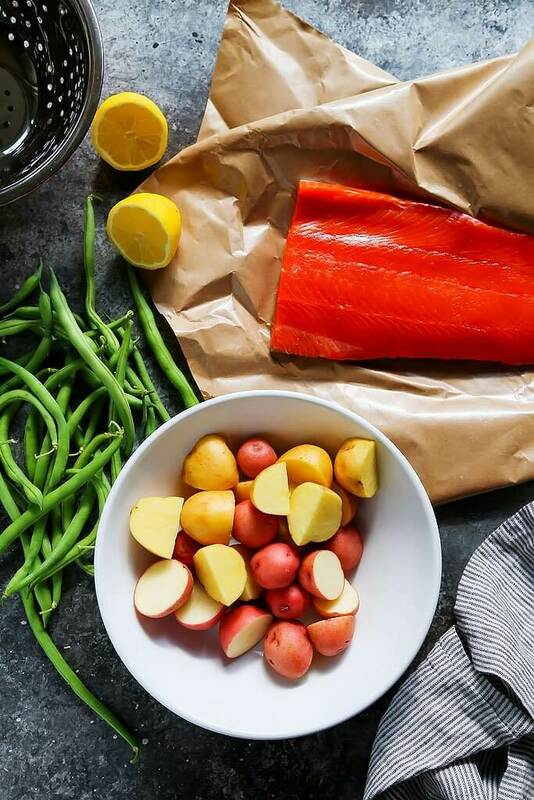 Today I’m using a similar approach – I’m tossing some baby potatoes with the Italian dressing, letting them get nice and roasty on the sheet pan first, and then adding some green beans and salmon to the mix. I also gave those green beans a good rub down with the dressing and then drizzled a bit over the salmon before baking too. At this point we’re up to 4-ingredients: potatoes, green beans, salmon and Italian dressing. I went ahead and threw one more ingredient into the mix too – just to add a little extra bit of flavor —> Lemon! I squeezed the juice of an entire lemon over the top of the veggies and salmon and then sliced it up and let it roast away during the last bit of cooking time. The result was amazingly flavorful, the salmon stayed moist, the potatoes got crispy, and the green beans got nice and browned and a bit caramelized. And then I cheated a little bit… I threw one more ingredient into the mix, but this is totally optional… I served it all up with a bit of tartar sauce on the side. Yum! 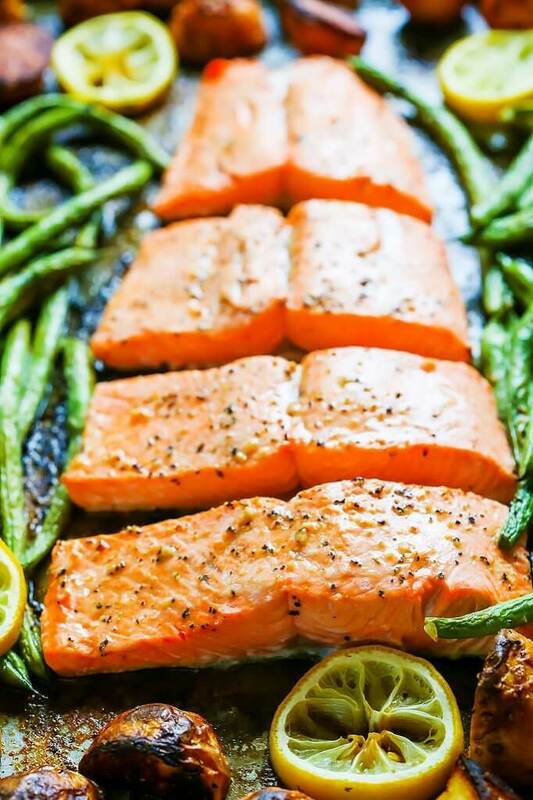 This healthy, quick and easy 5-Ingredient Sheet Pan Salmon is perfect for busy weeknights and can be changed up in so many different ways. Don’t like green beans? Swap in some zucchini, broccoli, red peppers or asparagus instead. Not into potatoes or doing the low carb thing? Skip them entirely and just load up you sheet pan with more veggies! Have you tried any one pan dinner recipes yet? What are some of your favorites? I’d love to hear in the comments below. If your potatoes are browning too quickly under the broiler, tent them with some tin foil. Feel free to use fat-free Italian dressing in this recipe too for a healthier option. Swap out the green beans or potatoes for your favorite vegetable. The options are endless! Pinot Gris has a nice acidity to it and its notes of citrus will pair well with the lemon that’s squeezed over the salmon. I love sheet pan dinners. It makes life so much easier because there aren’t a million pots and pans being used (and having to be cleaned- the worst part). 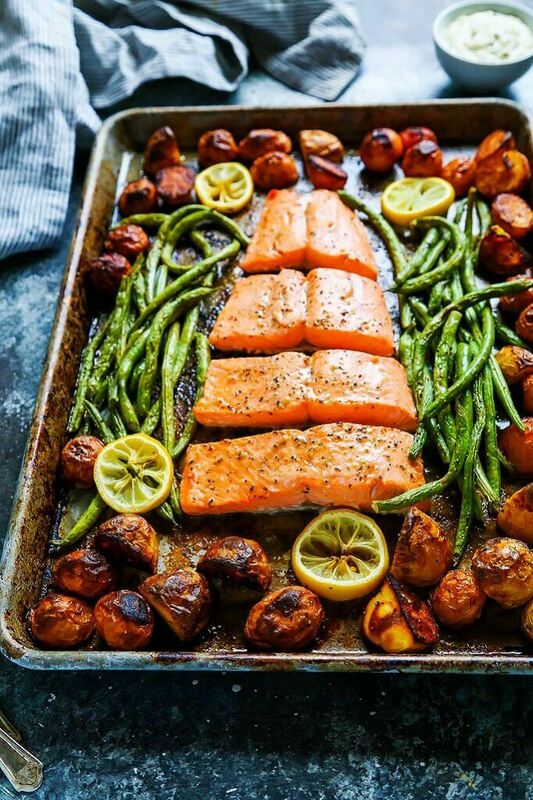 Those potatoes on this sheet pan dinner look incredible! Hot damn that looks amazing! I’m totally fascinated by that Italian dressing with the salmon. Such an interesting addition. I have to admit, I’m the last to get on the sheet pan bandwagon, but I think I NEED TO. Looks like such a simple way to create a well rounded and delicious dinner. I love the idea of cooking all of this on just one pan. Just a nice complete meal for a busy weeknight! Thanks Erin – I love easy dinners! That looks amazing, you photos make it look irresistible. I’m actually vegan but my husband is not, and I know he would adore this dish. Thanks Sam – I hope he loves this salmon dinner! One of the things I struggle with at dinnertime is figuring out what sides to pair with the recipe I want to make. Your recipe does the work for me – I love it! I’m the same many times Megan – I love that you can just pick your favorite veggies for these sheet pan dinners and let it all roast along together. Cheers! I’m glad you enjoyed it Albert! The cooking time can definitely vary with the size/thickness of your salmon, so it’s always good to keep a bit of an eye on it. Cheers! I love sheet pan dinners! And with few ingredients, this looks like it would be super easy to throw together. Looks delicious. Thanks so much Hannah – Enjoy! The cleanup is easy? Look at that pan!!!!!! Hi Lucy – Cleanup is extra easy if you line your pan with foil prior to baking. Cheers! (US Aluminum ) foil. Tin foil is far to expensive to use, that is if you can get it these days. Nit picking I know, but for someone who worked in the Aluminium industry for years, it is very annoying! Do you use liquid italian dressing or the powdered packaged? Hi Bea – I use liquid Italian dressing. Hope that helps!